Heaven is calling on believers to hide themselves in the secret place of the Most High. Hurricane Irma was the largest hurricane ever recorded in the Atlantic. But even this mighty force of nature cannot overpower a single humble believer who claims the mighty promises of Yah. 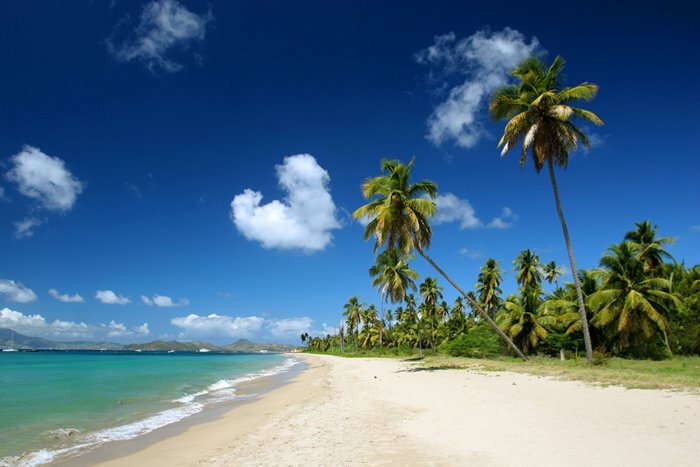 The island of Nevis in the Caribbean. Hurricanes are one of the most deadly forces of nature known to man. A hurricane can toss a 2-ton vehicle as though it were a child’s toy. Its mighty winds can rip roofs off buildings, leaving nothing but a pile of rubble in their wake. The storm surge that accompanies such monstrous winds creates their own danger. How could one defenseless family with three young children aged 8, 5, and 2, survive such an incredibly dangerous situation? This was the reality facing a family2 living on the island of Nevis. It was Tuesday, September 5, 2017, in the small Caribbean island of Nevis with a population of 15,000 people. The still air and clear sunny sky stood in stark contrast to the intense arrival we battened down for that day. Almost the size of Texas, Irma was churning its way towards us packing deadly hurricane-force winds of 185 mph, gusts of more than 200 mph, and a dangerous storm surge. 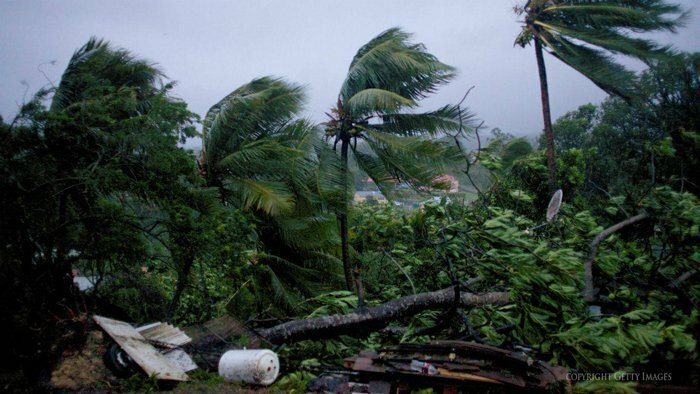 A week before we had heard of a possible hurricane warning, but it was too early to think much of it; we had been living in the Caribbean for more than 5 years and hadn’t experienced more than an occasional storm. Monday, a day before the hurricane was to hit, Irma was a category 3 hurricane. Monday evening we found that some of the hurricane shutters would not close because the wood was warped or they were missing bolts. We were thankful that a man came the following morning to help us fix them. Tuesday morning as I was reading my Bible through I was at Isaiah 59. After reading Isaiah 59:19, “When the enemy shall come in like a flood, the Spirit of the Lord shall lift up a standard against him.” I thanked Yahuwah for this providential assurance and I imagined the standard was an angel standing between us and the hurricane, saying, “Wind, touch not.” I was comforted by the thought that I was in the Hands of the Master of Nature. That morning, we learned that Irma increased in intensity from a category 3 to a category 5 hurricane as it headed towards warmer waters with low vertical wind shear. Irma was the largest hurricane the Atlantic basin had ever seen and it would hit the northern Leeward Islands first, of which St. Kitts and Nevis are included. 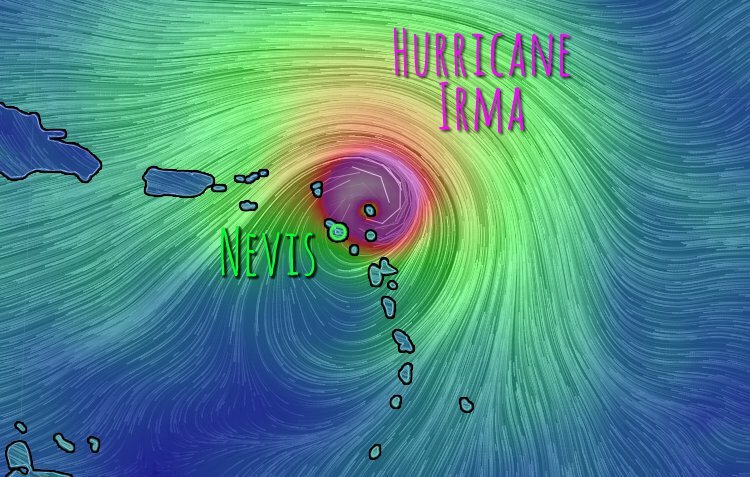 The forecast of the hurricane track showed the eye of the hurricane passing right through St. Kitts and Nevis. 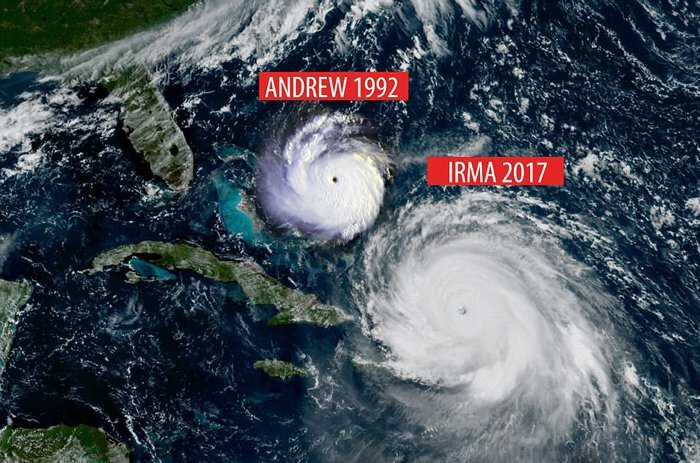 Satellite imagery comparing the relative size of Hurricane Andrew, also a category 5 hurricane, with Hurricane Irma. Since record keeping began, there had been only three category 5 hurricanes to hit the United States: the “Labor Day” hurricane of 1935; Hurricane Camille, in 1969; and Hurricane Andrew in 1992. Hurricane Irma defied categorization. Category 5 hurricanes are reserved for storms that have wind speeds in excess of 157 miles an hour. Hurricane Irma’s wind speeds reached 185 miles an hour (295 km/h), prompting some commentators to suggest that a new category of hurricane should be added to the scale: a previously unheard of category 6. But the sheer size of Irma was the truly incomprehensible part. It dwarfed every previously known storm. I was scared that I wouldn’t be able to stand and be thankful for whatever happened. I believed it was Yahuwah’s perfect will for our lives and that whatever He permitted was for our eternal good. So I asked Him to help me remain calm, trusting and thankful. I went on the internet to gather information about category 5 hurricanes and watching some videos illustrating what happens during category 5 hurricanes to try to determine what we could expect. We decided we would stay in a room in the basement with one door and one window facing the Atlantic Ocean. We explained to our children, ages 8, 5 and 2, that we would sleep there since we believed that the increasing storm was likely to take the roof off the house and cause substantial damage, but that angels would protect us as they did with Noah and his family during the flood. We invited an elder brother and his three-year old grandson to come stay with us. Tuesday afternoon, we headed for the room in the basement, with blankets, towels, water and snacks. We put the goats and the chickens in the other larger room next door. That evening, we sang “Will Your Anchor Hold?” “Under His Wings,” “A Shelter in the Time of Storm,” “We Build on the Rock,” and “It is Well With My Soul.” We read a few examples in the Bible of how Yahuwah was a very present help in trouble. As the children fell asleep, I lay down. I listened to an audio-book, The Battle Plan for Prayer, because I remembered a story of a family seeing a tornado coming, hiding under the dining table and pleading for Yahuwah to save them only to find that everything around them was destroyed except were they stayed. I listened to that story several times that night. Some people said the hurricane would pass around 2 o’clock in the morning, others said it may come the next morning, Wednesday around 8 o’clock in the morning. Later in the night, I saw everything dissipate and all that was left was the account of my life as Yahuwah saw it, what I had overcome and what I had yet to overcome. The chord between me and Yahuwah’s protection were His promises. And I felt that that these were all that I had left, and they became so precious. I recited promises and found Psalm 46 and Psalm 121 especially comforting, so I clung to those. All night we didn't hear or feel anything, there was a short time when I heard a little of wind, but nothing stronger than what we hear whenever it rains heavily. We would have heard and felt the hurricane if it came because one of the window panes was broken from earlier and the hurricane shutters did not seal the window completely, so we were expecting rain to blow in through the cracks in the shutter. This did not happen. When I woke up in the morning, I thought the hurricane must be coming around 8 o’clock in the morning, since it still had not made its way. We turned the radio on and learned that it had already passed! I couldn’t believe it. As we ventured out we found a few broken branches in the garden, but not even the chicken coop that had an open entrance and no walls got wet inside! We kneeled and thanked Yahuwah for His incredible merciful protection and loving care. There was flooding the day of the hurricane and after. The road in front of our house had turned to a gushing river of water. There was cleaning to be done all over the island. Hurricane Irma blew north to pass gently over the island of Nevis. Yahuwah was The Refuge. He was The Shelter in the time of storm. He is The Shelter in every storm of life. Yahuwah the Faithful had kept His promises. After Hurricane Irma passed, all that remains of a home on St. Bart’s is a pile of rubble. Yahuwah communicates to His children in a variety of ways. He speaks to them through Scripture, through impressions on the heart from the Holy Spirit, and He speaks to them through nature. Usually, believers focus on the beauty in nature: the care the Creator demonstrates through the way He provides for the birds of the air, and the lilies of the field. But He can also speak through the destructive power of nature as well. It is important to know these things because Yahuwah only allows to happen those things that can be used for our greater, spiritual good. 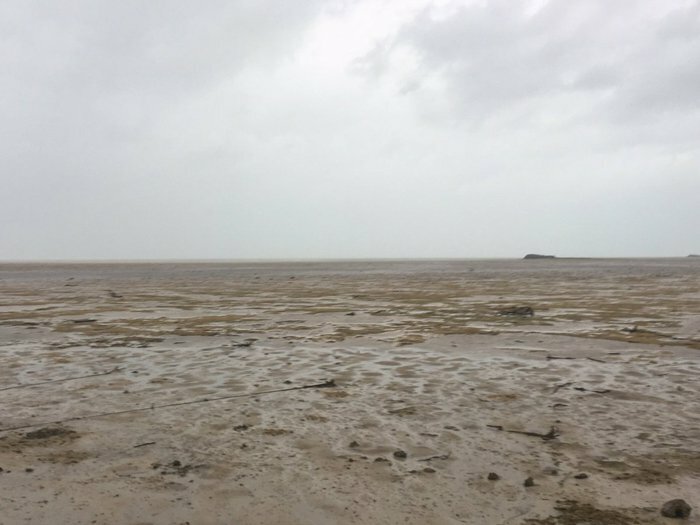 A photo posted on September 8, 2017, from Twitter user, Adrian, shows the ocean missing as far as the eye can see. Amos 3 contains a promise precious to the hearts of all believers: “Surely Adonai Yahuwah will do nothing, but He revealeth His secret unto His servants the prophets.” (Amos 3:7, KJV) While the text obviously and primarily refers to Yahuwah revealing the future through prophecy, the principle that Yahuwah reveals what is coming applies to nature as well. When Yahuwah responded to Job’s questioning, He did so by asking a series of questions designed to demonstrate the Almighty’s power as compared to man’s weakness and insignificance. These are questions multitudes never give a thought to. And yet, when calamities come, it is vitally important that they be seen as the harbingers of coming events. That is the only reason Yahuwah either, 1) sends destructive storms Himself; or, 2) allows evil men with their evil agendas to manipulate the weather and artificially create conditions that are calamitous to masses. Hurricane Harvey, a category 4, followed so swiftly by Hurricane Irma, Hurricane Jose (currently still a threat at the time of this writing), and even more already forming, are Heaven’s blaring alarms: wake up! Do not make the mistake of shrugging off natural disasters as being of no consequence. Yahuwah asked Job: “Hath the rain a father? Or who hath begotten the drops of dew? Out of whose womb came the ice? And the hoary frost of heaven, who hath engendered it?” (Job 38:28-29, KJV) These are not idle questions. Here, Yahuwah is taking ultimate responsibility for the weather patterns of earth. But He doesn’t stop there. He flat out states that extremes of weather will be used at the time of the end. Storms are a part of the natural eco-system of earth. But when storms are as large and destructive as the current string of hurricanes currently battering the Caribbean—Harvey, Irma, Jose, and Maria—believers need to sit up and take notice because Yahuwah is warning there is more to come. 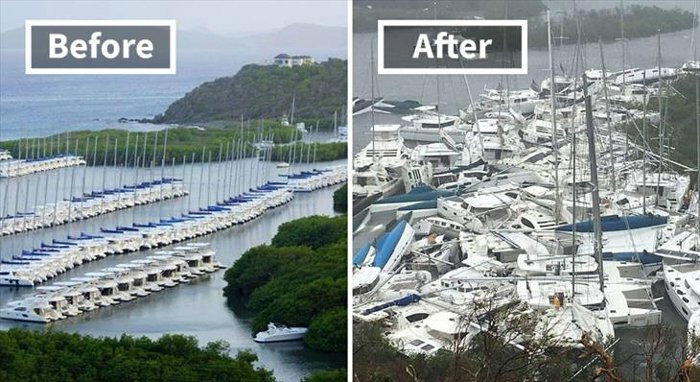 Paraquita Bay in the British Virgin Islands before and after Hurricane Irma. Hurricane Irma ranked among the most powerful hurricanes ever recorded in the Atlantic Ocean. The storm maintained wind speeds of at least 180 mph for 37 hours, setting a record for the most intense storm for such a long duration anywhere on Earth. Stretching almost 400 miles across, it was an absolute monster, with hurricane-force winds extending outward up to 80 miles from the eye of the storm. 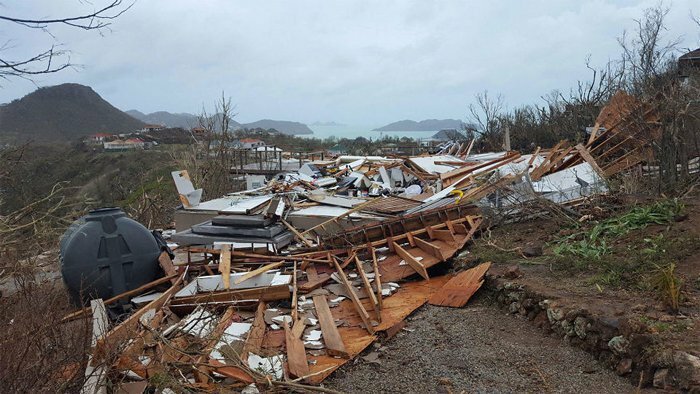 Hurricane Irma also ravaged St. Martin, which is around 50 miles North of Nevis, and the Virgin Islands, which are 170 miles northwest of Nevis. Just days later, category 4 hurricane, Jose, narrowly missed St. Martin but, at this time, Hurricane Maria, another category 5, is again lashing St. Martin. Heaven is calling, pleading, begging: wake up! And it’s true. Anyone who has been following the news knows that so-called “natural” disasters have been increasing on an exponential scale since the 1960s. The new “normal” is record-breaking events: record-breaking heat waves; record-breaking floods; record-breaking precipitation; record-breaking arctic cold. In 2016 alone, there were three “one-in-1,000-year” floods in the United States! In other words, floods so bad, they have a one-in-1,000 chance of occurring. And that’s just floods within the United States! While this chart shows a drop in 2010, the number of natural disasters since then has actually spiked. Worldwide, natural disasters are increasing, both in frequency and magnitude. Every single month in 2017 has been filled with one natural disaster after another. Truly, the words of the Saviour are being fulfilled as never before. Whether the weather aberrations are due to genuine natural disasters, or whether they are due to artificial manipulations by men with an evil agenda, all declare the end of the world is upon us. Heavy rains hammer Zimbabwe, and flooding kills hundreds. Close to 2,000 are left homeless. Flooding also occurs in Pakistan, Peru, Malaysia, Philippines, the United States, Indonesia, Thailand, and South Africa. A series of four major earthquakes in four hours strikes Italy. Flooding overwhelms Kentfield, England, and New Orleans in the United States, while a severe flashflood in Málaga, Spain, causes widespread damage to buildings, roads, and vehicles. Heavy rains trigger flooding and landslides in Chile, leaving millions without clean drinking water. Flooding also engulfs Mozambique, Morocco, and Colombia. Flooding continues in Indonesia, and South Africa. South Africa is still suffering under epic flooding. Flooding also occurs in New Zealand, Peru, Brazil, and Argentina. Massive Cyclone Debbie causes $1.84 billion(US) when it impacts Queensland, Australia. Fourteen people are killed. Additional flooding in Zimbabwe causes the deaths of even more people. Flooding and massive landslides occur in Indonesia and China. Flooding continues in New Zealand and Argentina. Iran, Kazakhstan, Colombia, Jamaica and Missouri, in the United States, all experience devastating flooding. Botswana shocks the world when a 6.5M earthquake rocks the country. Earthquakes in this very stable region of Africa are virtually unheard of. Montreal, Canada, declares a state of emergency when it is inundated with the worst flooding it has experienced in decades. The government enforces mandatory evacuations. Jamaica continues to flood while Arkansas, in the United States, and Quebec, in Canada, are inundated with water. Haiti, Indonesia, China, and Sri Lanka are also buried under a deluge of water. Colorado, in the United States, is hit by a hailstorm so strong in shatters windshields on cars. Portugal is swept with wildfires, resulting in the loss of more than 60 lives. ABC News reports on “Severe Weather affects millions” in the United States. A variety of extreme weather destroys homes and businesses, causing millions of dollars worth of damage. Among these events is a 4.4M earthquake, followed by a swarm of over 2,000 tremors, at the massive, Yellowstone volcano. An explosion by this immense “super volcano,” scientists warn, could conceivably kill every single person living in the United States. China and Tunisia experience devastating flooding. A severe hailstorm pounds Istanbul, Turkey, and triggers flash floods a mere week after Istanbul was inundated with record flooding. Meanwhile in China, over 50 people are killed and 38,000 homes are destroyed when over 60 rivers flood. The flooding forces 1.2 million people to evacuate. India, Turkey, Amman and Japan are inundated with torrential flooding. Deadly floods in India, and Nepal kill more than 1,200 people and force millions from their homes. At the same time, torrential rains in Sierra Leone trigger devastating floods and mudslides that kill hundreds of people and leave thousands homeless. Meanwhile in California, in usually chilly August, the city of San Francisco shatters the all-time record high at 106 F./41 C., while it reaches 115 F./115 C. south of the city. Northern California continues to bake in the triple digits. Washington State is on fire. British Columbia, Canada is on fire. Alberta, Canada is on fire. Manitoba, Canada is on fire. Most if not all of the above fires were due to lightening strikes. Nearly 40,000 lightening strikes occurred during the 24-hour period of September 10 to 11, in southern California alone. Texas is under water from Hurricane Harvey. India, Nepal, Pakistan and Bangladesh, experience record monsoons and massive death toll. Italy, France, Spain, Switzerland, Hungary, Poland, Romania, Bosnia, Croatia and Serbia are crushed in the death grip of a triple digit heat wave, dubbed Lucifer. Southern California continues to swelter under triple digit heat that shows no sign of letting up. A 5.3M earthquake rumbles through Idaho. Japan experiences a 6.1 earthquake with possible tsunami. Hurricanes Harvey, Jose and Katia are barreling around the Atlantic with 8 more potentials forming. On September 6 an immense X-class 9.3 solar flare occurs. On September 7, there is an 8.1 magnitude earthquake in Mexico. Beach lines recede at least 50 meters and more. CNN reports it is the strongest earthquake to hit Mexico in a century. Dozens are killed. September 10 has another large eruption from the sun. Another X-class flare totaling 8.2. 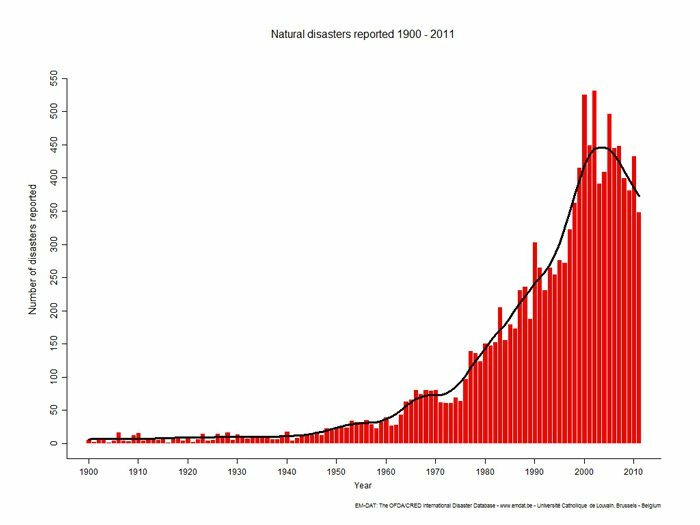 Another chart showing the drastic increase in natural disasters. The thing each one of us must remember is that “all these are the beginning of birth pains.” These calamities declare the end is here! From here on out, events in the world will only intensify and escalate. As bad as things are, they are but a foretaste of what lies ahead. The fact that calamities world-wide have reached the magnitude and intensity that they have is itself a warning of what is yet to come. Revelation 8 and 9 detail events in the near future under the symbolism of seven angels blowing seven trumpets. With each new blare of the next trumpet, a new disaster falls upon the earth. The last three trumpets are so horrific that even the Bible refers to them as “woes.” Now is the time to cling as never before to the great and precious promises. And yet, through it all, Yahuwah’s goodness shines forth. This time of unprecedented tragedy and catastrophe is designed to draw the world’s attention to the seriousness of the times in which we are living. Many good people have lost their lives in the on-going calamities that herald the beginning of the end. Whether we make it to Heaven through the grave, or without seeing death is, ultimately, in the hands of the Father who knows what is best in every individual circumstance. At the time of this writing, Hurricane Irma has dissipated but calamities continue. Hurricane Maria is churning its way to Puerto Rico. The National Weather Service has stated: “This is an extremely dangerous hurricane and life-threatening impacts are anticipated across PR [Puerto Rico] and the Virgin Islands.”9 This is a serious problem. Many of the people evacuated from other islands before and after Hurricane Irma, were taken to Puerto Rico! If Maria makes land fall in Puerto Rico, it will be the first category 4 or 5 hurricane to do so in 85 years. However, one family on Nevis knows in whom they have believed. World’s Last Chance implores you: don’t let Heaven’s warning fall on deaf ears! 1 Written by Priscilla Jane Owens in 1882. 2 Names have been withheld upon request. 3 Written by Vernon J. Charlesworth, circa 1880. 5 Written by Edward Mote. 7 Written by William O. Cushing. 8 Ellen G. White, Christ’s Object Lessons, p. 412, emphasis supplied.